Longdown House was built in the 1960s, and no doubt gained this title as the building is perched on the edge of a stunning downland hillside. Unusually, the house had a complete south elevation of single-glazed, steel Crittall windows; such that the interior of the building was either chilly and cold, or baking hot. The new owners commissioned significant alterations and enlargements, but wanted to keep the character of the 1960s design, and this desire was very much in tune with the practice’s own sense of fun and dynamism. 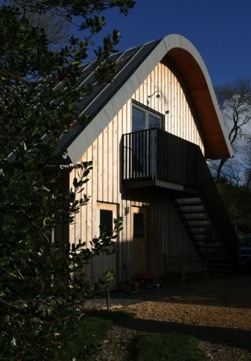 Longdown house was also unusual in that it has a curving, crescent-shaped plan, with the kitchen end hard up against the steep downland slope. 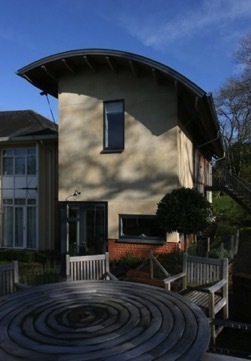 The alterations we devised, therefore, included a significant landscape scheme cutting away much of the bank and forming a substantial house, complete with studio garage, stepped gardens, rainwater harvesting, and irrigation systems for the expected long hot summers on the downs. 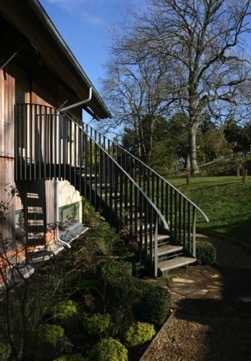 The practice’s design retained and extended the curved plan, with the external steel bedroom stair continuing this flowing movement out onto the upper garden. 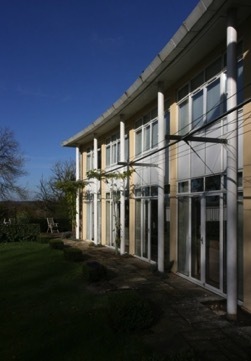 To ameliorate fluctuations in temperature, the original curtain-glazed elevations of the main house were renewed with modern double-glazing which matched the look and layout of the original fenestration, and additional shielding from heat gain was provided by a new system of solar shades. Indeed, by the end, hardly a skirting board or ceiling was left untouched, and it can truly be said that an ‘Architectural Abracadabra’ had been performed.